Oh, to go back to the year 1964…The Mustang was introduced on April 17, 1964A base model 1964½ Mustang Coupe with the standard 6 cylinder, 3 speed manual transmission started out at $2,368. Customers loved the fact that they could purchase an affordable sporty vehicle while they could still have the look of style and elegance in their vehicle. As one Mustang owner explained, “It’s a four passenger sports car with trunk space AND it doesn’t cost an arm and a leg. It handles like it was made in Italy and goes like Mr. Eliminator…and at the same time it is solid, tough, nimble and rides like a little fat cloud”. 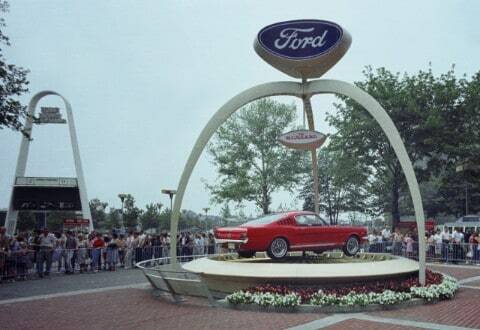 Within a few weeks after introducing the Mustang, Ford dealers broke sales record after sales record. By July, 1964 100,000 Mustang Coupes and Convertibles had moved through the assembly lines. No other car had skyrocketed so quickly into the ranks of the top sellers. Additionally, the Mustang was “designed to be designed by you”, which made reference to the several options available to customize the Mustang. “The Mustang four-seater starts life with the kind of equipment and options most cars take years to come by” says a Mustang owner. Indeed, the Mustang phenomenon had begun. By August, 1964 the striking new 2+2 Fastback body style was in it’s final design and tooling stages and was about to join the Coupe and Convertible craze. By 1967, there were 1.5 million Mustangs on the roads, both in the U.S. and abroad. Between 1964 and 1973, over 3 million Mustangs had sold.